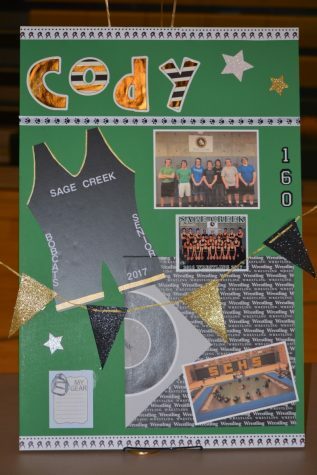 “I am proud to be a part of the original wrestling team at Sage, and to start a legacy,” Strachan said. 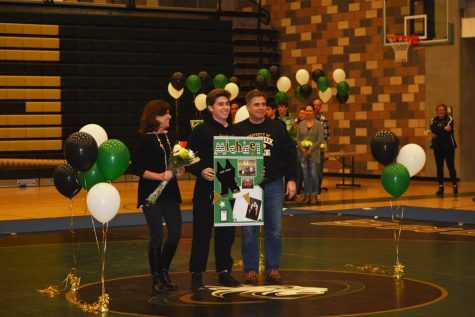 Caleb Strachan stands with his dad, Jeff Strachan, and Iris Strachan, his mom, on senior night. 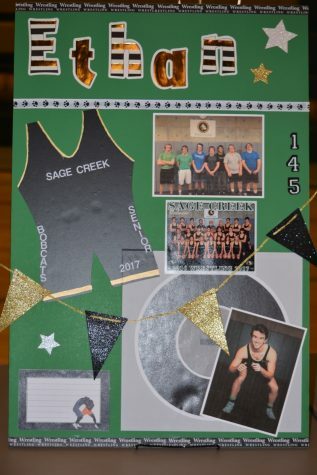 “I think what I am going to remember is the adrenaline when you get on the mat and the energy that you get when you are practicing. It definitely isn’t your ordinary sport and I’m more than grateful to be part of this great team,” Kerekffy said. 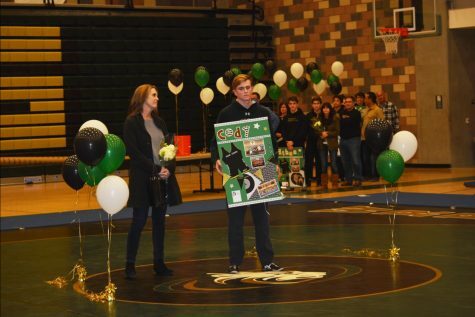 Cody Kerekffy stands with his mom, Debbie Kerekffy, on senior night. 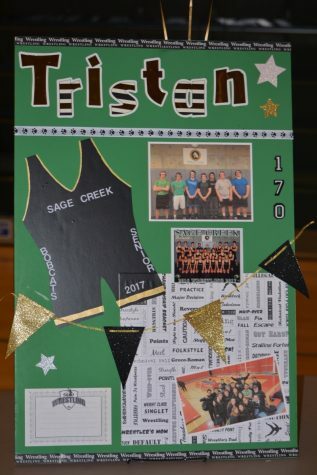 “One of the things I am going to miss the most about being on the wrestling team is the bonds we formed. Being in that close of proximity to the same people for 4 months you form a bond that resembles more of a brotherhood than anything else. 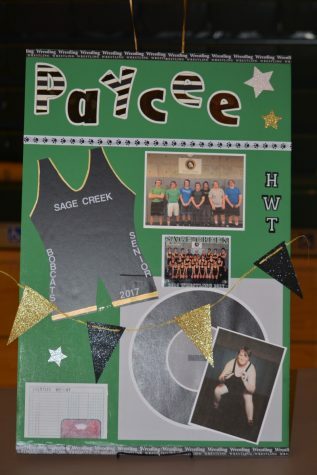 I enjoyed being the captain of the team because I was able to see every one grow and mature through the last 4 years, and it’s an awesome feeling knowing that I am leading a team that’s capable of competing with some of the best teams around,” Hyatt said. 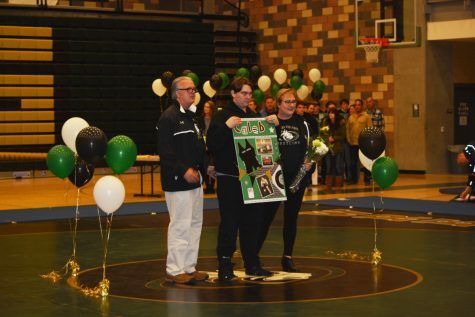 Ethan Hyatt stands with his dad, Drew Hyatt, and his mom, Janice Baker, on senior night. 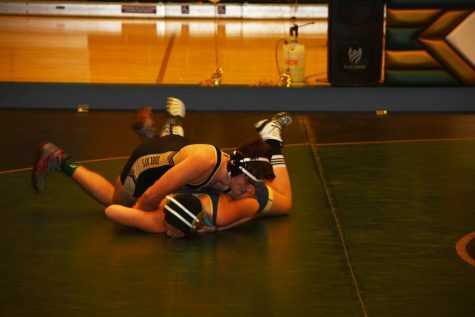 Ethan Hyatt wrestles in the 154 weight class. 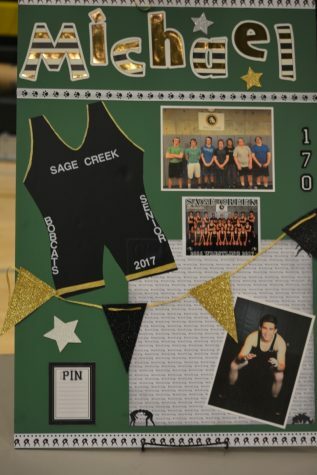 “I am going to miss that nervousness before practice where you know it’s going to be hard but you laugh about it with your teammates,” Schnese said. 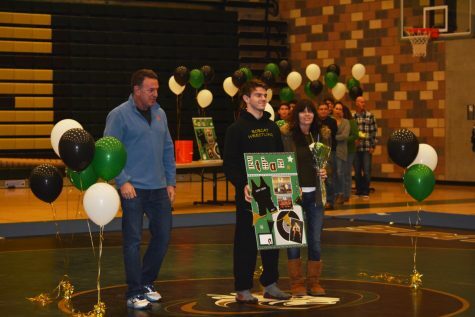 Michael Schnese stands with his dad, Jones Schnese, and his mom, Moira Schnese, on senior night. “I am going to miss tearing my enemies to shreds,” Martinez said. 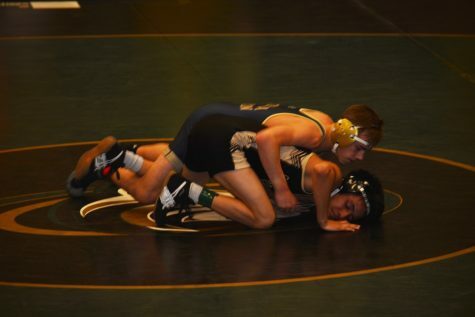 Naehu Martinez wrestles in the 138 weight class. “I love the comradery, and I like seeing the new kids improve throughout the year. It’s always fun when a lightweight and give me a run for my money,” McMillan said. 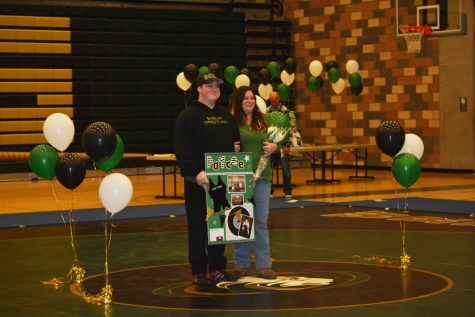 Paycee McMillan stands with his mom, Sarah McMillan, on senior night. 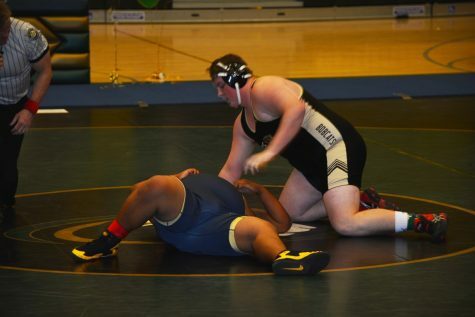 Pacyee McMillan wrestles for the heavyweight weight class. 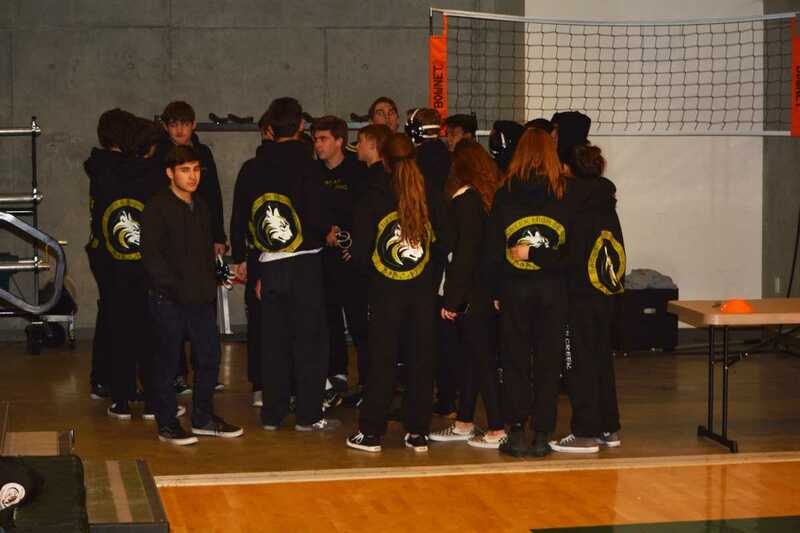 “The main thing I am going to miss is the whole team. 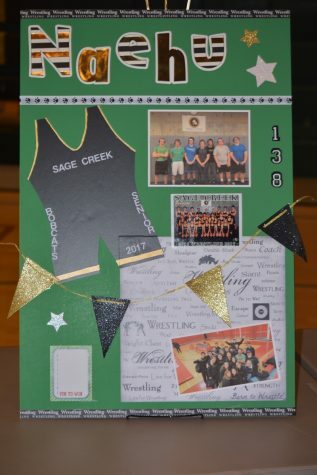 I have tried other sports like lacrosse and volleyball, but in wrestling everyone feels a lot more like family. Plus, the duels are always extremely fun because it’s just you out there with your whole team cheering you on. 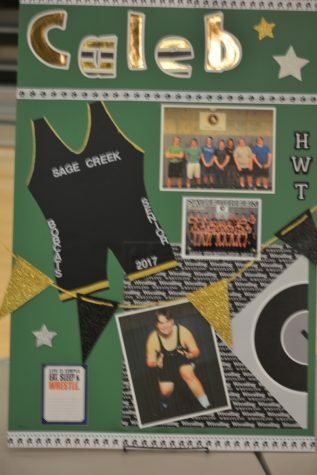 Lastly, the singlets give you a huge confidence booster. I always feel more beautiful when I wear them,” Schwanidt said. 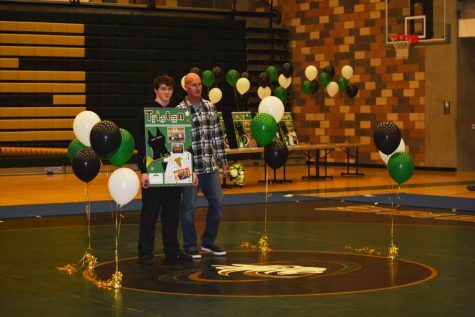 Tristan Schwandt stands with his dad, Kevin Schwandt, on senior night. 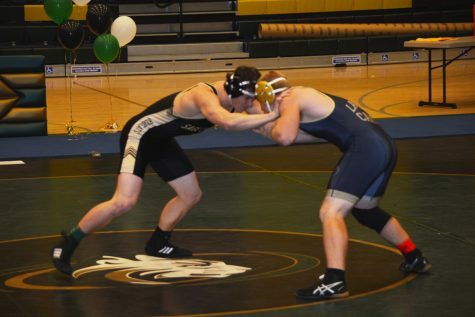 Tristan Schwandt wrestles in the 184 weight class.